We spent a good deal of the Saturday wedding reception lamenting there’s only one Peirce sister left to wed. Three down, Kelly to go. The sisters are uniformly vivacious, beautiful and fun, just like their mom, Patti. The weddings have been such joyful extravaganzas we were all sorry Patti didn’t have a dozen daughters. Patti is married to Paul and Paul is my pooka. More on that in just a bit. I’ve lost track but Paul and Patti are on the verge of celebrating something like their 68th wedding anniversary. Because theirs was a mid-70’s shotgun wedding, they celebrated both an actual anniversary and one they told their parents to avoid scandalous questions involving birthdays and basic math. I remember one time Paul and I were sitting in a bar -- our natural habitat -- and hearing a guy instruct a college-age friend on the importance of proper birth control. I met Paul in 1989 after bosses at the Greensburg Tribune-Review transferred me to work with him in the two-person Latrobe bureau office. Prior to that Paul’d worked with a string of co-workers whose extracurricular interests did not merge with his. It was the start of a nationwide carouse that’s lasted nearly 25 years. What’s been most fun for me is to watch how peoples’ opinions of Paul have changed over the years even as Paul hasn’t changed one bit. By remaining the way he’s always been, he’s become absolutely beloved. I began noticing this a few years ago whenever friends started coming up to me whenever I was momentarily Paul-less. “Hey, have you seen Paul?” they’d ask. They’d want to know how he was doing. I’d tell them without exaggeration he was doing great. He’s one of the happiest men I’ve ever known. It was like Paul was Santa and I was the elf in charge of the naughty and nice lists. Those conversations confirmed what I already knew: Paul’d become my pooka. 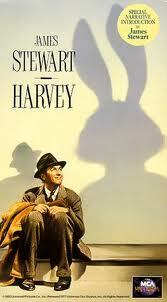 I didn’t even know I had a pooka until a couple of years ago after we took the kids to the Jimmy Stewart Museum in Indiana, Pa. From the DVD bins, I snagged the 1950 movie “Harvey.” Hadn’t seen it in years. In it Stewart plays Elwood P. Dowd, an affable dimwit who believes he’s accompanied everywhere by a 6-foot-3 invisible white rabbit who shares his fondness for drink and laughter. For the purposes of this story, I’m the affable dimwit, the most obvious casting since 1939 when producers of “The Wizards of Oz” cast a dog named Toto to play a dog named Toto. That exact situation’s happened thousands of times with Paul and I, and Paul is bigger and grander than any 6-foot-3 invisible rabbit. It helps we’re both attentive listeners. I admit to growing misty at Meghan and Ryan’s wedding watching Paul walk his youngest daughter down the aisle and later hearing all the warm tributes to this most happy bride’s parents. It’s been a real privilege for Val and I to be part of their lives and to watch Paul and Patti raise Tiffany, Lindsey, Kelly, and Meghan from precocious and engaging children into joyful and successful adults, two of them now parents themselves. “Harvey” concludes with Dowd selflessly giving the warden of the mental hospital from which he’s just been liberated permission to take Harvey with him. But Harvey has other ideas. He chooses to stay with Dowd. I guess that’s the way it is with all the great pookas. They’re too important to too many to keep all to yourself. You just have to thankful any time the big pooka chooses you.